It is widely known that I love bourbon. However, my enjoyment of whiskey is not limited strictly to bourbon. My goal for this blog is to expose good whiskeys at good prices. The other day I had the opportunity to drink a whiskey that certainly fit that bill – Rittenhouse Rye Bottled-in-Bond. 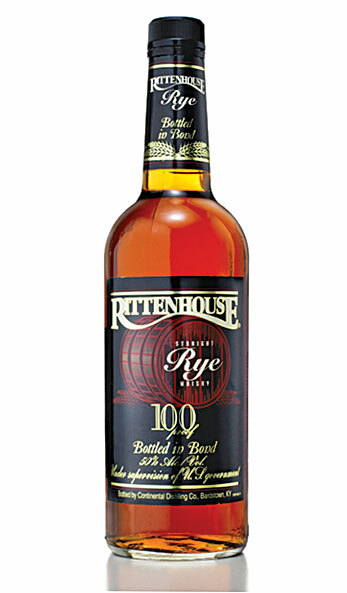 Rittenhouse is a rye whiskey made at the Brown Forman Distillery and distributed by Heaven Hill. Rye whiskey is like other whiskeys in that it has to be made from cereal grains and at least 80 proof. Like bourbon with corn, rye whiskey must be made from at least 51% rye grain. Rye whiskeys can be made anywhere, but they are most commonly made in either Canada or the United States. Rye is a very flavorful grain, which tends to make rye whiskeys a big, bold flavor profile. If you enjoy rye-forward bourbons like Wild Turkey and Four Roses, then it is definitely worth taking a look into some rye whiskeys. Rittenhouse is a great place to start. Rittenhouse Rye is also “Bottled-in-Bond,” which means that it is bottled at 100 proof and made under specific government regulations. In 1896, when the U.S. government first passed the act clarifying what whiskey should be, being bottled-in-bond was a measure of the quality of the whiskey. Mostly, the term means that the whiskey was distilled all in one season (not batched between different whiskeys from different years) and aged at least four years in a federally observed warehouse. Nowadays, the craft whiskey market is a serious business such that being bottled-in-bond does not mean as much in 2012 as it did in 1896. Nevertheless, it is interesting to note that Rittenhouse Rye is Bottled-in-Bond. On the nose, Rittenhouse is purely delicious. The two most prominent notes are the sweet aromas of honey and vanilla. However, there is a fantastic underbelly to the nose containing floral notes (lavender, lilac) and spiced notes (cinnamon, nutmeg, ginger). The most noticeable flavor once you take a sip is the earthy, spicy rye character to the whiskey. However, it is balanced very well by sweet cinnamon and ginger and a healthy helping of vanilla. The finish is long and very good, filled with sweet spice and earthy flavors. The finish hits at first with cinnamon and rye notes, and moves into the more hearty notes reminiscent of herbal tea. The spiciness and sweetness often resurge as the whiskey goes on. Overall, this is a fantastic whiskey. There is a ton going on here, but it is all in good balance and at a great price. This is a rare find where I’m at, but I usually see it for around $25 if it’s in stock. Hopefully this review will kick start a journey outside the comforting confines of bourbon whiskey. I will try to do some more non-bourbon value reviews in the coming weeks. My grade: B+. Price: $20-25/750ml. This is a great pour at a great price. This is a pour that you can have often, and your friends will be very impressed. B+ is an erroneous grade to me – I give it a solid A and for value an AA++. Makes the best Manhattan I’ve ever had. Great stuff. Fair enough, Brian! Rittenhouse really is the best rye in its price point by far! As far as its cocktail power, I tend to like a really dry, spicy rye, but that is just a matter of preference. Have you ever tried any of the older Rittenhouse Ryes?